This was the beginning of what was supposed to be the highlight of our China trip of this year: a visit to the Badain Jaran Desert near a town called Alashan Youqi. A few sentences in the Lonely Planet had put me up to this adventure; under the caption ‘Bayan Khot’ it said: “One daily bus goes to Alashan Youqi … at 7.10 am. “ Moreover, a boxed text in the Inner Mongolia chapter mentioned “… the remote but stunning Badain Jaran Desert…”, which was apparently a 30-minute drive away from this Alashan Youqi. However much I looked on the Internet, I found little else. In fact, there didn’t even seem to be a road on the maps I consulted. And so, while driving through the depressingly familiar mixture of white-tiled urban sprawl, manic traffic and choking pollution that took us from Yinchuan bus station to the centre of the Old Town, doubts kicked in. With a feeling of near panic I thought of my friend who I had persuaded to take a week off work from his job in Beijing (北京) to join us on this trip. Yinchuan (银川), the rather non-descript capital of China’s north-western province of Ningxia (宁夏), won’t win any prizes for aesthetics. 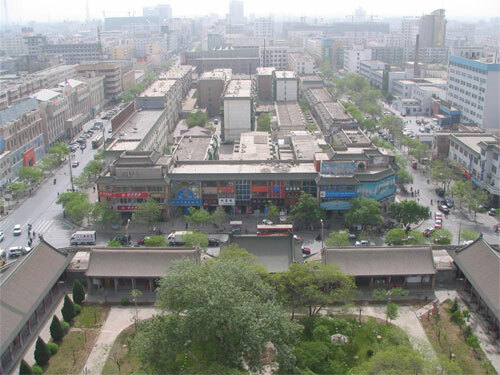 Even the so-called old town, known as Xing Qing Qu, is really just a motley jumble of new and not so new buildings, hotels, shops and malls. However, that is not to say it is entirely disagreeable. The area near the Drum Tower is a pleasant place for strolling, especially at night when it’s all lit up. There are a couple of parks, some terraces and also plenty of decent restaurants to replenish your strength after a vigorous day of sightseeing outside the city. And it’s precisely the sights outside the city that make a visit to Yinchuan well worth your while. 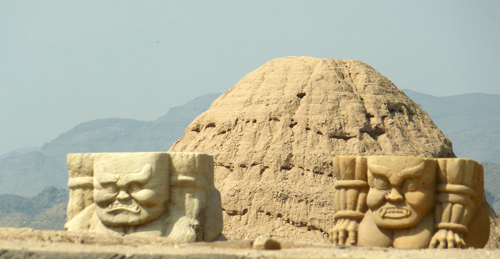 Though Yinchuan’s monuments are conspicuous by their absence, the city’s fascinating surroundings make it a great place to base yourself for a couple of days’ exploring. What’s more, for the time being at least, the area hasn’t really been discovered by tourists. 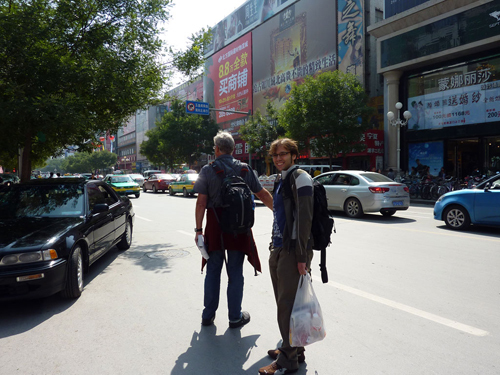 Other backpackers, and foreigners in general, are few and far between in these parts, so much so that an elderly Muslim lady, the proprietress of a liquor store, asked me without batting an eyelid: “What ethnic group do you come from in China?” (“你是中国什么少数民族?”). This came as a bit of a surprise to this tall, big-nosed, hairy barbarian. Driving through the city, on our way out to the sights, we notice that Ningxia’s reputation as a poor, backward province isn’t really evident in Yinchuan. In fact, Yinchuan is far from poor. It’s a classic example of how the wealth of Eastern China can trickle down to the remote hinterland; and how the wealthier Eastern part of China’s demand for raw materials is contributing to the growth and development of far-flung mineral- rich regions such as Ningxia. As soon as we leave the city, we are in for another surprise. Built on a seemingly arid plain under the shadow of the jagged peaks of Helan Shan (贺兰山), the countryside around Yinchuan is surprisingly fertile and pretty, due to an ancient but sophisticated network of water channels that irrigate the fields with water from the nearby Yellow River. 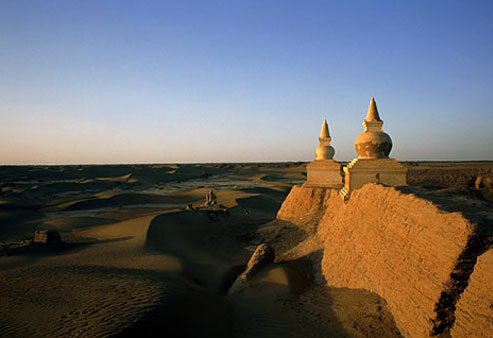 These pinkish-beige, soft mounds of earth, set in a vast landscape of desert and scrub, with towering mountains in the distance, are Yinchuan’s main drawing card. 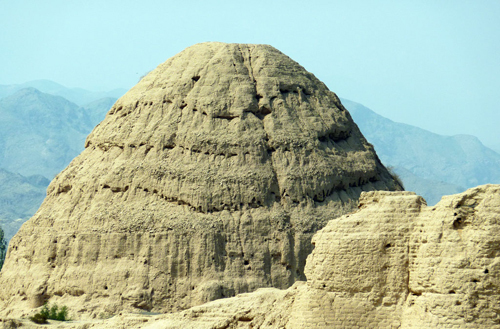 Located some 35 kilometers out of town, the tombs offer an amazing insight into a sophisticated civilization that once had its own language and writing script, but was wiped out in its entirety by Genghis Khan’s Mongol army. The tomb complex is massive, another surprise, with a vast parking lot, a small electric train to take visitors around, and a whole array of souvenir and snack stalls. Visitors are first taken to the museum, which has some remarkably good pieces, especially sculptures. 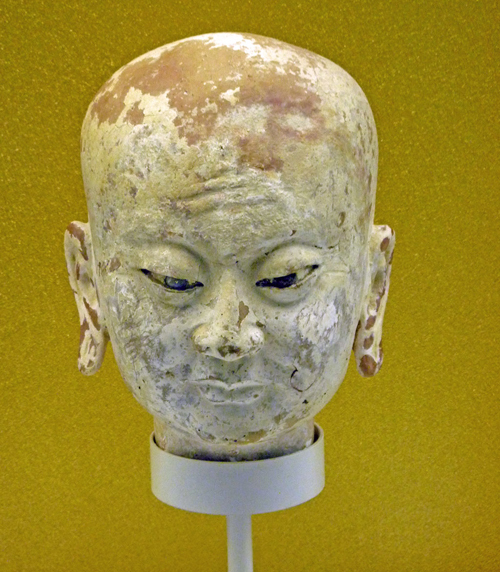 We were particularly taken by a couple of monks with very personable faces and some ethereal, celestial ladies, witnesses to the importance of Buddhism in the Western Xia Empire. 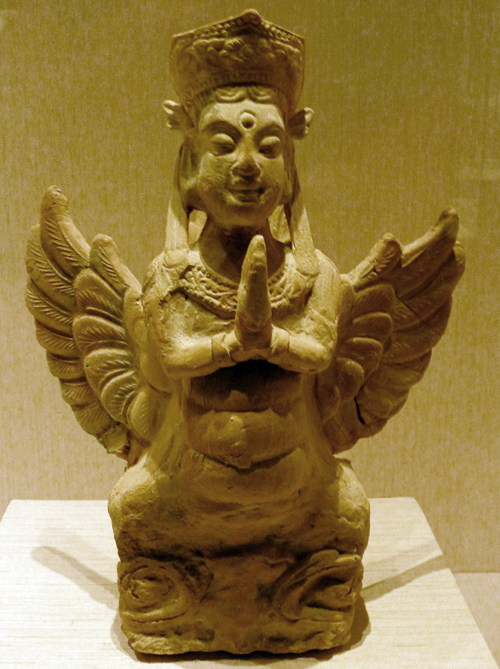 On the other hand, the curious half bird- half human kalavinka and the even more astounding squat ogresses with sagging breast that once formed the bases of columns, seem to point to older, perhaps more savage aspects of Xi Xia culture. The next stop after the museum is a courtyard building with an almost life-size display of colourful plaster figures, representing key scenes from Xi Xia history, up to the Empire’s destruction by Mongol hordes. By this time I’m striding about impatiently, muttering: “But where are the tombs? 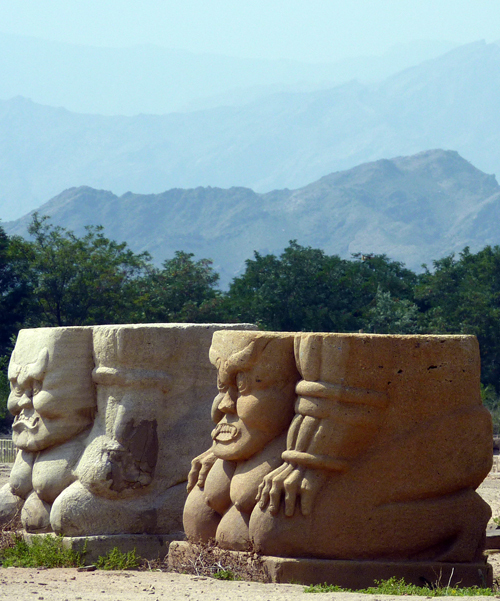 I want to see the tombs.” Luckily, the tombs are next, a short walk past some stelae and inscriptions away. 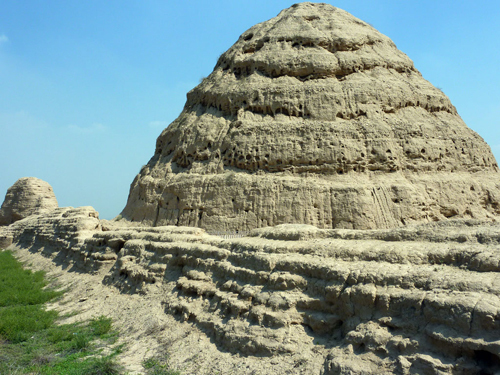 Though the passing of time, and the Mongols, have reduced the tombs to mere mounds of earth, riddled with holes and surrounded by crumbling walls, they were once apparently topped by pagodas with tiled, upturned roofs. In fact, a large pile of such tiles can still be seen next to Tomb number 3, the main tomb, belonging to the founder of the empire Li Yuan-hao. Despite the lack of many tangible remains, the vast arid plain surrounding the Tombs, dotted with dozens of other pink mounds (which can only be visited by obtaining a special permit), the forbidding mountain range in the distance, the absence of hordes of visitors and the general sense of peace and quiet, lend this place a melancholy and romantic air. 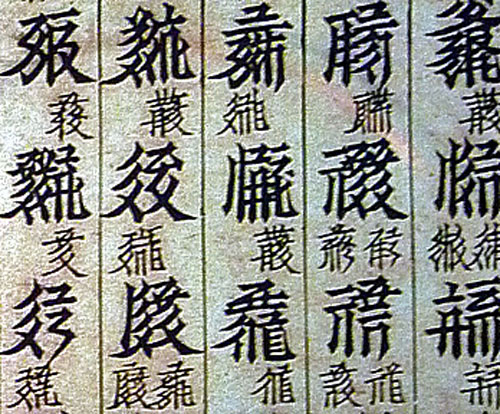 The geo-political situation in early 13th century China was characterized by a precarious balance of power between the Song (founded by emperor Taizu who set up his capital in present-day Kaifeng) who ruled in the south and centre, the Jin who originated from Manchuria and controlled the northeast, and the Tangut people of Xi Xia who had originally come from Tibet and now reigned over the north west. All three got in the way of Genghis’ ambitions to conquer the whole of China and thus had to be dealt with. The founder of the Xi Xia Empire, Li Yuan-hao, had established his capital at or near present-day Yinchuan from where his people ruled the narrow Hexi or Gansu corridor, a fertile and strategically important part of the Silk Road that provided access to the heart of the Middle Kingdom (China). 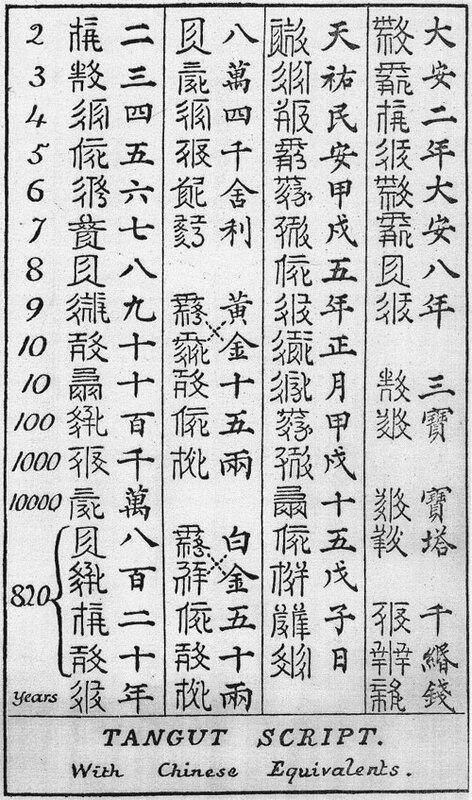 Li Yuan-hao, who realized the importance of a written script for the running of an Empire, instructed his scholar Yeli Renhong to devise a new script. The result of his endeavours was the Tangut script, which consists of 6,000 complex characters that look Chinese, but aren’t. 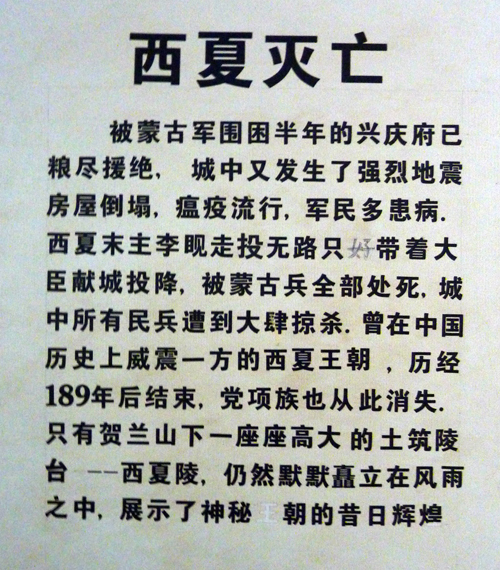 In fact, the script remained inaccessible to the Chinese for a very long time. 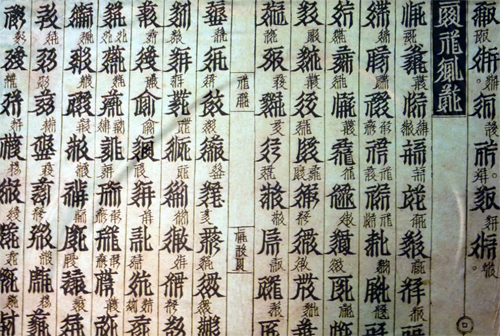 Both the script and its inventor form part of the colourful history display at the Tombs, while the museum holds several authentic samples of Tangut texts. Under Emperor Li Yuan-hao’s guidance, Xi Xia became a sophisticated state, ruled by scholars and bureaucrats trained in state schools. 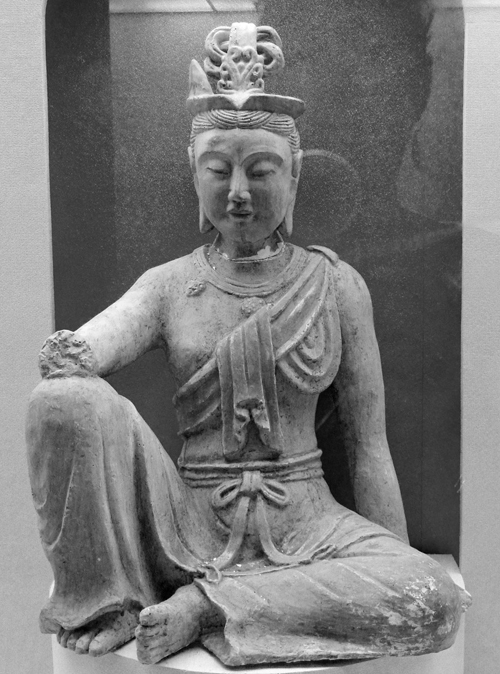 Buddhism became the state religion and the Emperor was revered as a semi-deity. 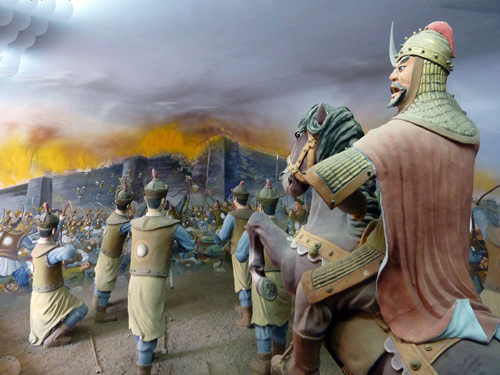 In the spring of 1209, Xi Xia was first invaded by Genghis Khan who urgently needed loot to keep his troops satisfied, and who wanted to turn prosperous Xi Xia into a tribute-paying vassal state, before concentrating on his other direct rivals, the Jin. 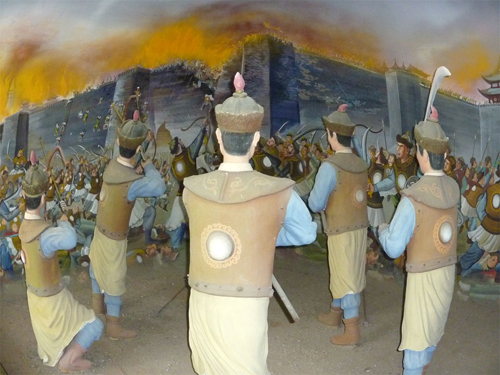 Though Genghis’ troops could easily defeat the Tanguts in battle, they found it a lot harder to take the city of Yinchuan, as they had no siege weapons or experience in that type of warfare. 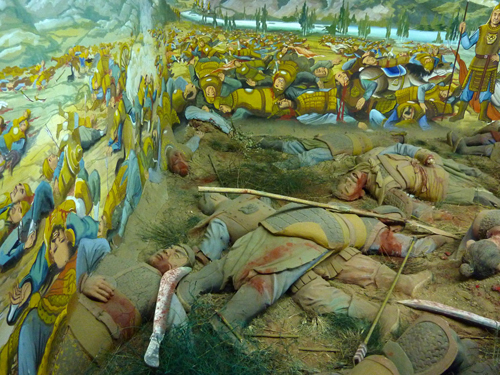 They tried to flood the city by breaking the dykes of the ancient irrigation canals, but the move backfired when the rising waters obliged the Mongol army to withdraw to higher ground. The result was an uneasy settlement: Genghis received a Tangut princess as a wife and the Tangut Emperor submitted, pledging his allegiance and support. 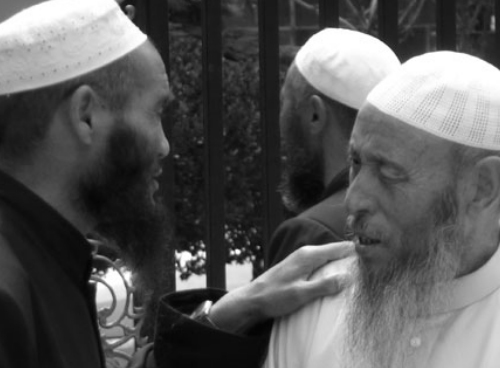 In spite of the armistice, relations between the Mongols and Xi Xia remained strained. In 1227 the Mongols embarked on another campaign (it was to be Genghis’ final one) in which they wiped out the Tanguts, now under the young and inexperienced Emperor Xianzong. 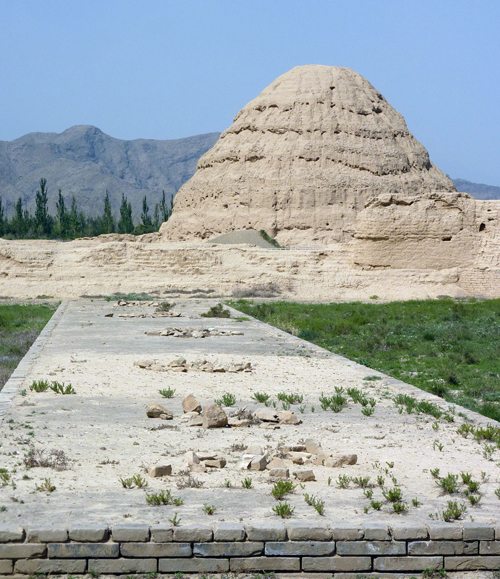 The Yinchuan Tombs were shattered and sacked by the Mongols, possibly in the first campaign in 1209 when Genghis flooded the plains, but more likely in 1227. 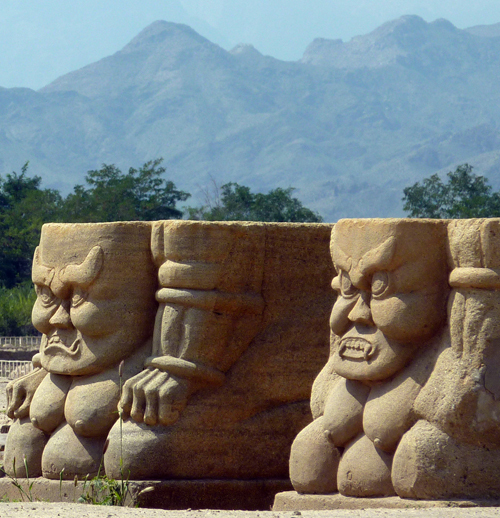 For many years hardly anything was known about the Xi Xia state and its civilization, and Chinese scholars paid very little attention to either. In fact, the first signs of interest came from abroad and some of the earliest studies were carried out in England and Russia. 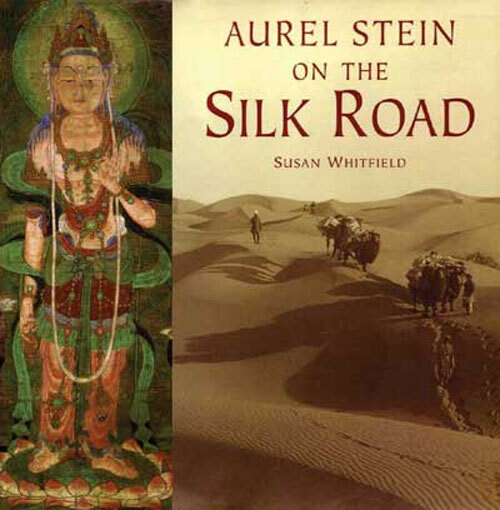 It wasn’t until after 1907, when the Hungarian-British archaeologist Sir Aurel Stein discovered a wealth of ancient documents in Dunhuang and took them to England to be studied, that experts began to learn about the region. Many of these documents are now in the possession of the British Museum and the British Library, much to the chagrin of the Chinese. 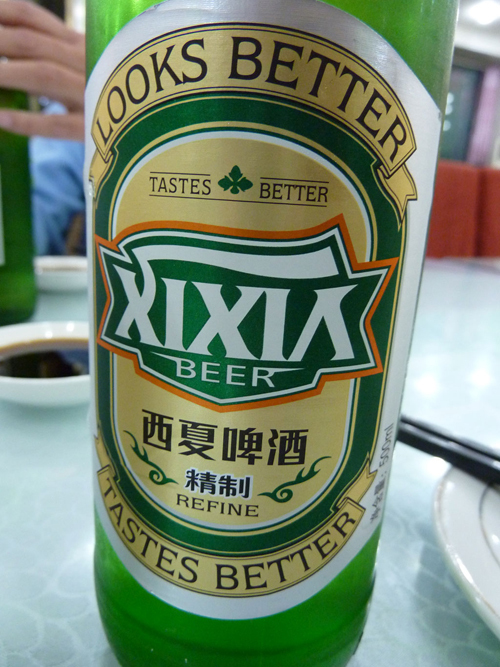 These days, the Chinese have also re-discovered the Xi Xia part of their heritage. The Ningxia University in Yinchuan boasts a Xi Xia institute and there are Chinese scholars who are experts in the field. 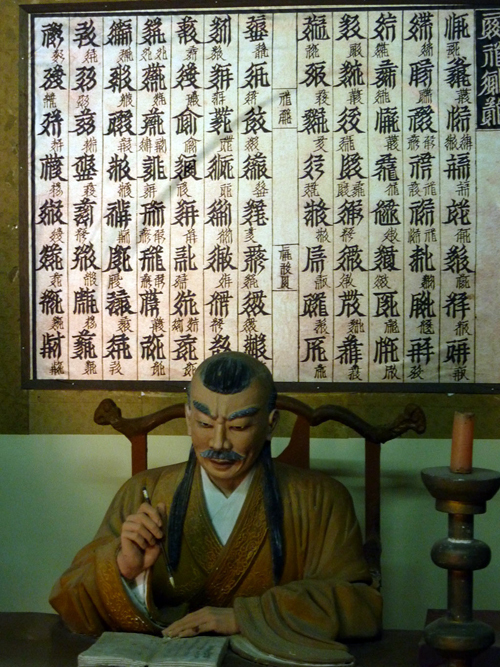 One example is Li Fanwen who devoted his life to deciphering the Tangut script, and whose Xi Xia – Mandarin dictionary was first printed in 2001. Getting there: You can take one of two daily buses to the Tombs, which apparently depart at 8:30 and 9:30 from Beimen Bus Station. Going back, buses depart from the tombs for the city centre at 13:30 or 15:30. Alternatively, you can hire a taxi there and back, or take one for the day, combining your visit to the Tombs with a couple of other sites. We stayed in the friendly and centrally located Yinxiang Dajiudian 银祥大酒店. Our neighboring rooms were massive, complete with sitting areas and hot/cold water machines; carpet stains and the state of our bathrooms were both reasonable, as was the price: 168 Yuan for a double. Fortunately, the karaoke located somewhere in the same building seemed to close quite early. Should you find the Yinxiang Dajiudian too dilapidated by the time you get to Yinchuan (these things can happen very fast in China), there seemed to be no shortage of hotels in the centre, though some of them may be on the expensive side. Our taxi driver recommended the hotel of Ningxia university, which is quite a way out of the centre, but closer to the Tombs and other sights. We saw it advertised on the Internet, starting from 224 RM a double. 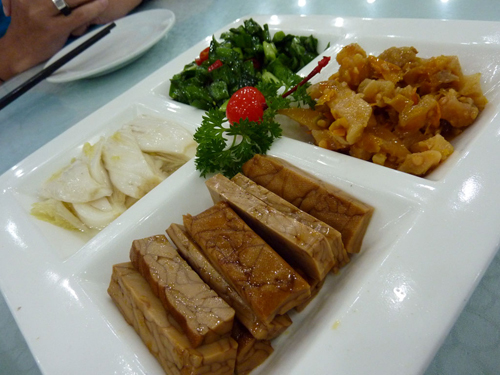 Yinchuan has some great eating options. We had an excellent seafood meal on our first night in the Wenzhou Seafood Restaurant (温州海鲜), which can be found on Liqun Dongjie. 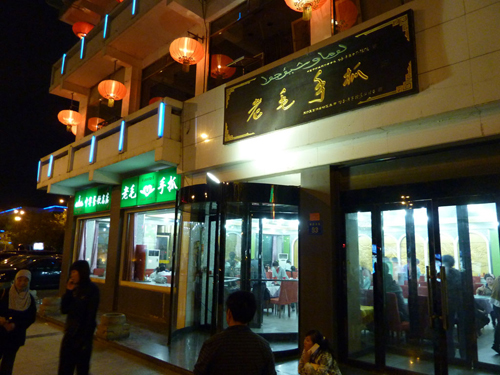 However, on our second evening, with our friend craving Huifan (回饭), or Muslim food, our taxi driver recommended the Muslim Laomao Shouzhua (老毛手抓) on Jiefang Dongjie, almost next to the Drum Tower, which seems to be the most popular place in town and is named after its star dish. Shouzhua (手抓羊肉) is basically a dish of cold boiled lamb with a lot of fat, which everyone seems to love, including our travelling companion, David, who had to wolf down half a kilo of the stuff as I, a non-meat eater, and Margie, too finicky for that type of meat, weren’t going to help him eat it. 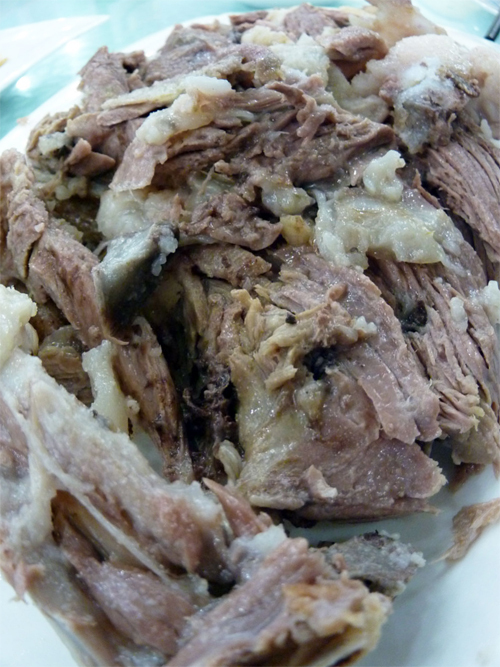 An alternative to Shouzhua Yangrou is Zirán Yángròu (孜然羊肉); literally, ‘cumin mutton’. 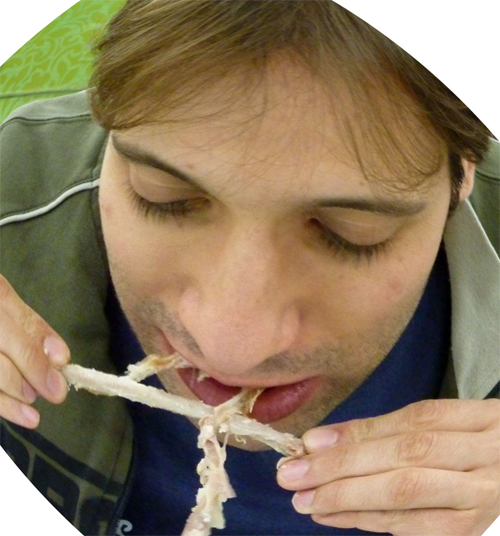 Whatever your taste buds enjoy, you’re likely to find something, as the rest of menu is extensive and the food excellent. The place has real buzzing atmosphere and seems to be always full. There’s also an amazing Huoguo (Hot Pot) restaurant, which has a romantic outside eating area, set around a lantern- lit pond. It is called Qian Jiao Bai Wei (千椒百味), The Thousand Chilies and Hundred Flavours Restaurant, on Fenghuang Nanjie (凤凰南街258号). Visiting the sights outside Yinchuan needs some logistical planning. Public transport to the sights is limited, and sometimes non- existent. You’ll probably find yourself having to hire a taxi for the day (baoche 包车). 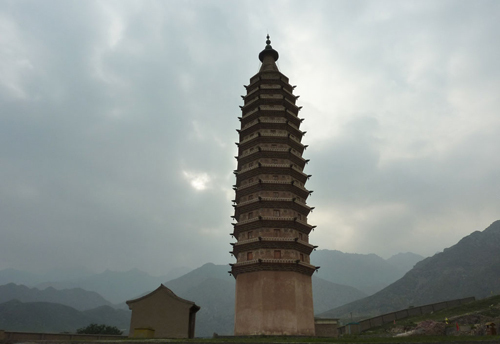 We hired a taxi in Yinchuan for 250 RMB for the day; this price included the Tombs, the Gunzhongkou scenic area, the Twin Pagodas of Baisikou, and the rock carvings of Helanshan Yanhua. However, we ended up paying our driver 300 RMB once we realized that the fact we were returning after 17.00 meant that he would have to compensate his co-driver (whose shift starts at 17.00) for his lost time. It is quite usual for Chines taxi drivers to share their vehicle and this may explain why they are sometimes reluctant to take you, as this may interfere with their and their partner’s schedules. We travelled to Yinchuan from Zhongwei by bus. There were almost hourly departures (between 7.50 am and 6.15 pm) from Zhongwei’s brand-new bus station (located out of town) and the ride took an uneventful three hours on the motorway. Leaving Yinchuan, we could have taken a bus to Bayan Khot, but opted for hiring a car instead (see stage four). According to Lonely Planet, there are half-hourly departures between 6.30 am and 6 pm. 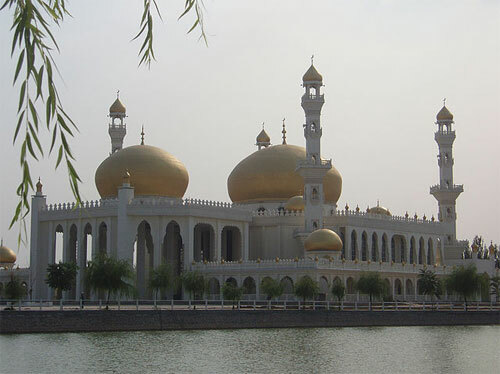 Just wanted to say thanks for your comprehensive summary of Yinchuan and the surrounding sights. I’m haeding there in a few months (my parents moved to Yinchuan for work) and wanted to explore – you’ve given me the best info possible so thanks! I will be putting up a little more info about Zhongwei, just a few hours south of Yinchuan, in the next few weeks.